Hans Lassmann is mainly interested in research on the pathogenesis of inflammatory diseases of the central nervous system with special focus on multiple sclerosis. His work includes studies on the molecular pathology and immunopathology of human inflammatory brain diseases and of experimental models of CNS autoimmunity. Current projects mainly focus on pathogenetic mechanims responsible for demyelination and neurodegeneration in the progressive stage of MS. 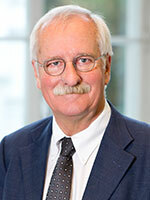 He has received many research awards, including the Charcot Award (2005), the SOBEK Foundation Award (2000) and the K.J. Zülch Award (2010).